In a pan on medium-low heat, add olive oil and sauté chopped onion until browned. Add squash and garlic, and cook for another few minutes. Pour in chicken stock and bay leaf, nutmeg, salt, and pepper. Cook until the squash is tender. Remove bay leaf and, using a hand mixer, purée preparation until completely smooth. Stir in cheese and milk. Toss in cooked pasta and serve immediately. Instead of nutmeg, add cumin for a distinct smoky flavor. Quick and easy recipes don't have to be bland or unhealthy. With a busy family to feed, I'm always looking for those types of dinner recipes. 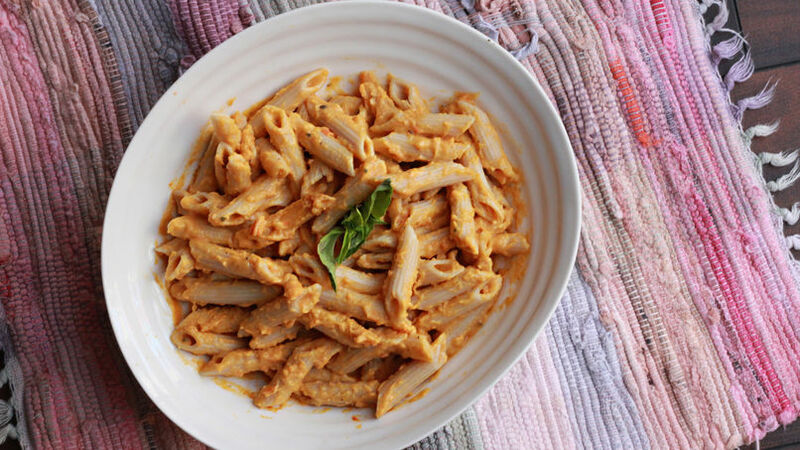 This creamy butternut squash pasta recipe fills my kids up, is inexpensive and can be made ahead or frozen for later.